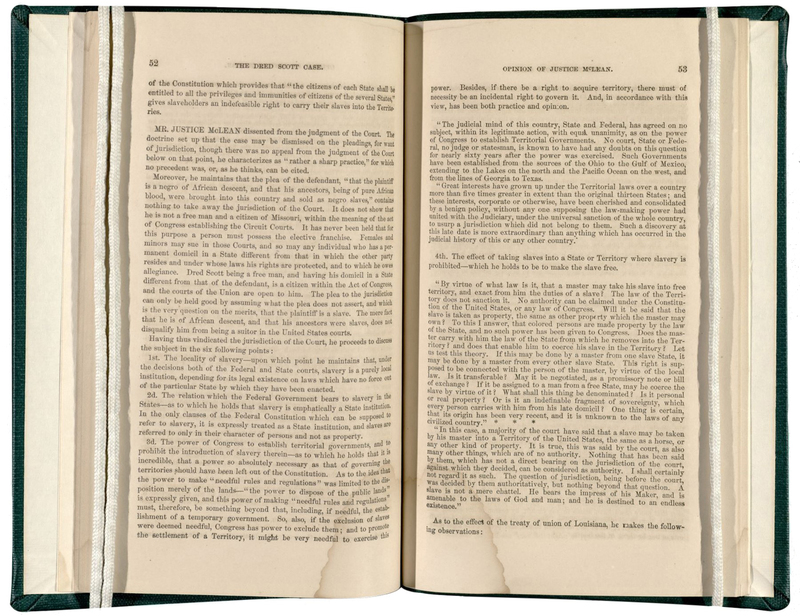 In honor of Black History Month, today’s Throwback Thursday (#tbt) features excerpts from our copy of The Case of Dred Scott in the United States Supreme Court. 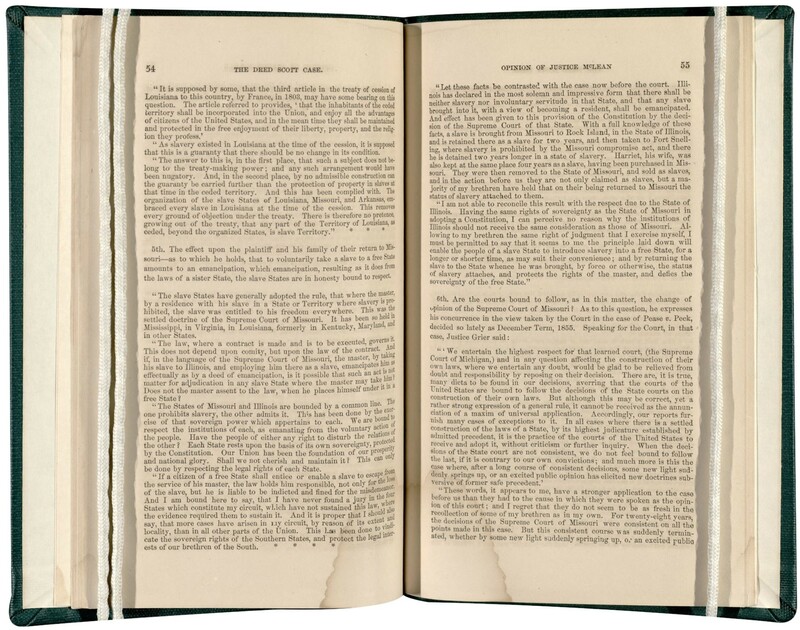 This book, which was published in 1860, gives background on this historic case, followed by the opinions of the United States Supreme Court Justices who presided over it. 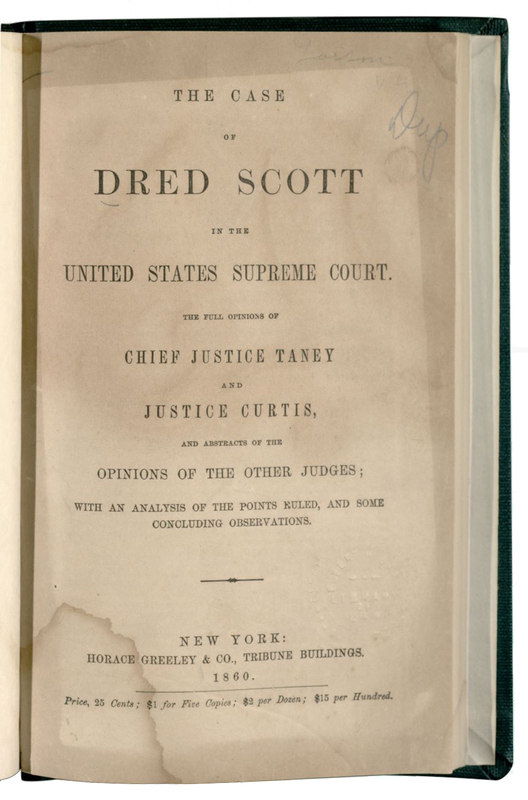 The Dred Scott case, formally Dred Scott v. Sandford, was brought by Scott, a slave whose master had passed away, in an effort to win his freedom. His master’s widow had asserted ownership over Scott and his wife, even though they had previously lived in the free states of Illinois and Wisconsin, and even though Scott had offered to compensate her should she agree. Her refusal led to a decade-long legal battle throughout the Missouri court system, which alternatively denied, awarded, and then rescinded Scott’s freedom, before his case finally landed before the Supreme Court of the United States. In its ruling, the Court denied Scott’s petition, stating that because of his African ancestry, he was ineligible for citizenship in the United States and, therefore, would remain the property of his American master. It was a controversial decision even in its own time; the sense of injustice felt in the North proved a strong motivation in the election of Abraham Lincoln as the nation’s sixteenth president, who famously abolished slavery. In this case, a majority of the court have said that a slave may be taken by his master in a Territory of the United States, the same as a horse, or any other kind of property. It is true, this was said by the court, as also many other things, which are of no authority. I shall certainly not regard it as such. The question of jurisdiction, being before the court, was decided by them authoritatively, but nothing beyond that question. A slave is not a mere chattel. He bears the impress of his Maker, and is amenable to the laws of God and man; he is destined to an endless existence. 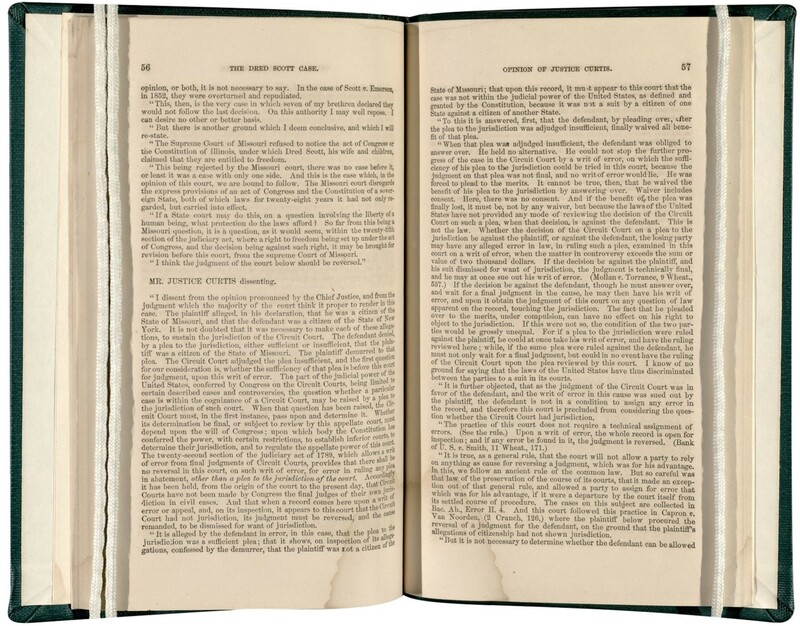 To see this volume, or our other rare book on the Dred Scott case, A Legal Review of the Case of Dred Scott (1857), please contact the Special Collections, Digitization, and Archival Services Library at Brittany.Adams@law.northwestern.edu. For more information on the Dred Scott case, see PBS’s Africans in America feature, or this video and article by the History Channel.